Mesquite is a characteristic tree of northern Peru, its name comes from the time of the Spanish conquest there is a similarity with the Mediterranean carob (Ceratonia siliqua).The scientific names for the species in the area are Prosopis pallida and Prosopis juliflora. The mesquite trees are long-lived trees, which have a complex root system that allows them to absorb water at different depths and lateral roots that capture rainfall easily; this is one of the main characteristics that make them capable of surviving in extreme drought conditions, significant in the dry forests of the region they are an excellent species for control of dunes and counter desertification. 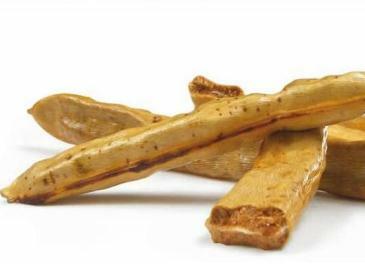 Mesquite can harvest timber (heavy and durable) and fruit (vegetable) pods that are high in sugars, commonly called carob which is mainly used as fodder for livestock; also used for human consumption in products such as peruvian carob. Mesquite is a fruit pod, elongated, when ripe is yellow with high nutritional value and when stored for more than three months becomes a dark yellow color, but without losing its nourishing properties, it contains: Protein B2, B6, which are rich in iron due to the immense depths its roots reaches, they are estimated to reach more than 50 meters, absorbing iron-rich minerals preserve carbohydrates which they convert into an energy product. 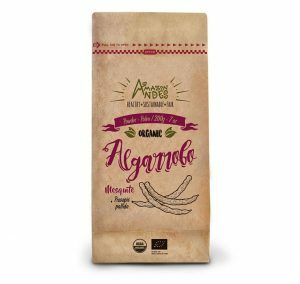 The quality of our products reflect the complete organic process of algarrobo cultivation ; beginning with our growers in the north cost of Peru. It has been quoted in Peru to have many medicinal uses, such as a juice where it is used as a purgative, for stomach aches, chills, dysentery, excrescences, eyes, flu, headache, hoarseness, swelling, itching, measles, throat, and wounds; Lewis (1977). Aqueous and alcoholic extracts are remarkably antibacterial. University of Arizona (1972). The pods were used by the indigenous people of northern Peru to make bread, and this use is claimed noting the high nutritional value of bread made from the dried and ground pods. In Peru a concentrated infusion made of carob pods a drink called "carob" is used, and how sweet syrup in fruit juices by high sugar content; NAS (1979). The nutritional value and digestibility of the ground pods are comparable to alfalfa, however, it needs to be processed. This is crucial when it comes to keeping blood sugar levels in the blood to maintain their levels of appetite and energy under control. Surges and drops in blood sugar can have a major impact on attention, concentration, clarity, energy and appetite. Keep sugar levels stable blood levels help maintain clarity and energy throughout the day and avoid eating unnecessary snacks. There are some reasons for doing this, but one of the main reasons is because it provides a good dose of fiber as they are low on the glycemic index. This helps people feel full longer, and fight cravings for high carbohydrate foods but plenty of nutrients. This means that the protein is already partially and ready for use in a cellular level break. This helps with faster growth and cell regeneration, which is essential for maintaining the long-term health and wellbeing. Provides cells with a mixture of much needed vitamins and minerals that help maintain healthy cells and tissues. Mesquite powder has been shown to provide high levels of zinc. Zinc is an essential part of the body's immune system, and has been shown to help prevent by increasing the production of white blood cells, and protect against unwanted invaders. The high fiber content is beneficial to the digestive system. It is not only helpful in promoting normal intestinal motility, but also helps to reduce inflammation and the appearance of polyps in the colon. The naturally sweet powder is also naturally low in fat and calories, so it is an excellent substitute for sugar or other sweeteners in recipes and smoothies. The superfine powder has been shown to help relieve some of the triggers that cause headaches and migraines. Mesquite powder shown to offer some soothing properties, which can help reduce the appearance of certain types of headaches. Of course, this is perhaps one of the greatest benefits of Mesquite powder. The powder has a taste similar to molasses. It is a rich deep flavor, complex emphasizing a variety of foods perfectly and makes a great addition or replacement of a variety of culinary masterpieces. There are no reports of serious adverse effects associated with the consumption of carob. Its consumption in designated therapeutic dosages can be considered generally safe, although side effects may include a feeling of fullness. Carob is likely safe when consumed in amounts usually found in foods. In the United States, carob is considered safe according to the GRAS list. Diabetes, hyperlipidemia (high cholesterol), Hypouricemia (low uric acid), known allergies or members of the Fabaceae family, peanuts (groundnuts) and other nuts, or who have experienced previous complications laxative drink powders forming volume . Carob is also considered likely safe when used by patients taking herbs or drugs by mouth, as carob bean gum may decrease transit time through the intestines. Carob for pregnant or breastfeeding is not recommended due to the lack of available scientific evidence. Carob may alter levels of blood sugar; caution is advised when using medications that may also affect the levels of blood sugar. Patients taking drugs for diabetes by mouth or insulin should be monitored closely by a qualified healthcare provider as you may need to make adjustments in medications. Stimulating Kidney: Carob and cranberry stimulate the sluggish kidneys, increasing the level of urine. Decoction of 30 grams of locust bean fragments per liter of water for 30 minutes. ; Strain and drink the desired amount. Take advantage of the medicinal properties of Algarroba if they are at hand. Laxative: With very good medicinal properties; have the seeds, rich in mucilage, and pods, especially when they are green because they are ideal for constipation. ; Decoction of 30 grams of locust bean fragments per liter of water for 30 minutes. Strain and drink the desired amount. Substitute Cocoa: The fruit can be used to develop a substitute for cocoa in the preparation of chocolate or for preparation of pies that are ideal if intestinal problems through the hypothalamus and the pituitary gland to help to balance the glands. Endocrine Astringent: other excellent medicinal properties of Algarroba; and which also serves as a remedy for diarrhea. Boil 50 grams of bark per liter of water. 4 cups a day. Is no proven safe or effective dose for carob? Have traditionally been used 20 grams daily with water? As powder, were used 20 to 30 grams of water, tea or milk taken once a day. There is no proven safe or effective dose for children carob, and its use is not recommended. Mesquite or Carob has different presentations according to their different processes, but has proven effective in each use.